The aorta carries blood from the heart to the vessels that supply the body with blood. If part of the aorta is narrowed, it is hard for blood to pass through the artery. This is called coarctation of the aorta. It is a type of birth defect. The exact cause of coarctation of the aorta is unknown. It results from abnormalities in development of the aorta prior to birth. Aortic coarctation is more common in people with certain genetic disorders, such as Turner syndrome. Turner syndrome is a rare genetic condition in which a female does not have the usual pair of X chromosomes. Aortic coarctation is one of the more common heart conditions that are present at birth (congenital heart defects). This abnormality accounts for about 5% of all congenital heart defects. It is most often diagnosed in children or adults under age 40. People who have this problem with their aorta may also have a weak area in the wall of blood vessels in their brain. This weakness causes the blood vessel to bulge or balloon out. This is known as a berry aneurysm. It can increase the risk for stroke. Symptoms depend on how much blood can flow through the artery. Other heart defects may also play a role. About half of newborns with this problem will have symptoms in the first few days of life. These can include breathing fast, problems eating, increased irritability, and increased sleepiness or becoming poorly responsive. In severe cases, the infant may develop heart failure and shock. A nosebleed is loss of blood from the tissue lining the nose. Bleeding most often occurs in one nostril only. There may also be no symptoms. The health care provider will perform a physical exam and check the blood pressure and pulse in the arms and legs. The pulse in the groin (femoral) area or feet will be weaker than the pulse in the arms or neck (carotid). Sometimes, the femoral pulse may not be felt at all. The blood pressure in the legs is usually weaker than in the arms. Blood pressure is usually higher in the arms after infancy. The provider will use a stethoscope to listen to the heart and check for murmurs. People with aortic coarctation often have a harsh-sounding murmur that can be heard underneath the left collar bone or from the back. Other types of murmurs may also be present. Coarctation is often discovered during a newborn's first exam or a well-baby exam. Taking the pulse in an infant is an important part of the exam, because there may not be any other symptoms until the child is older. Both Doppler ultrasound and cardiac catheterization can be used to see if there are any differences in blood pressure in different areas of the aorta. Most newborns with symptoms will have surgery either right after birth or soon afterward. They will first receive medicines to stabilize them. Children who are diagnosed when they are older will also need surgery. In most cases, the symptoms are not as severe, so more time can be taken to plan for surgery. During surgery, the narrowed part of the aorta will be removed or opened. If the problem area is small, the two free ends of the aorta may be reconnected. This is called an end-to-end anastomosis. If a large part of the aorta is removed, a graft or one of the patient's own arteries may be used to fill the gap. The graft may be man-made or from a cadaver. Sometimes, doctors will try to stretch open the narrowed part of the aorta by using a balloon that is widened inside the blood vessel. This type of procedure is called a balloon angioplasty. It may be done instead of surgery, but it has a higher rate of failure. Older children usually need medicines to treat high blood pressure after surgery. Some will need lifelong treatment for this problem. Coarctation of the aorta can be cured with surgery. Symptoms quickly get better after surgery. However, there is an increased risk for death due to heart problems among those who have had their aorta repaired. Lifelong follow-up with a cardiologist is encouraged. Without treatment, most people die before age 40. For this reason, doctors most often recommend that the person has surgery before age 10. Most of the time, surgery to fix the coarctation is done during infancy. Narrowing or coarctation of the artery can return after surgery. This is more likely in people who had surgery as a newborn. There is no known way to prevent this disorder. However, being aware of your risk may lead to early diagnosis and treatment. 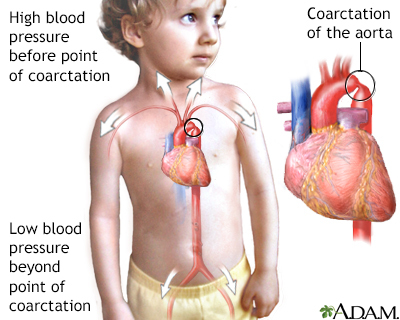 Coarctation of the aorta is a birth defect in which the aorta, the major artery from the heart, is narrowed. The narrowing results in high blood pressure before the point of coarctation and low blood pressure beyond the point of coarctation. Most commonly, coarctation is located so that there is high blood pressure in the upper body and arms and low blood pressure in the lower body and legs. Symptoms can include localized hypertension, cold feet or legs, decreased exercise performance, and heart failure.